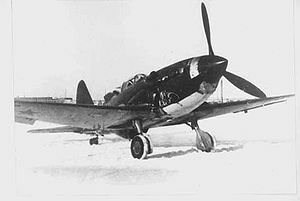 Sukhoi Su-1 or I-330 (Russian: Сухой Су-1) was a prototype Soviet high-altitude fighter aircraft built at the beginning of World War II. A revised version, designated Su-3 (I-360), was also built. In 1939, Sukhoi was tasked with designing a high-altitude fighter, the resulting Su-1 was a conventional monoplane with a streamlined wooden semi-monocoque fuselage, low-set all-metal wing made of duralumin and un-pressurized cockpit. The key feature of the aircraft was a pair of TK-2 turbochargers driven by exhaust gases from the Klimov M-105P engine. The prototype was completed in May 1940, flying for the first time, on 15 June 1940, with A.P. Chernyavsky at the controls, undergoing limited flight testing until April 1941, reaching a top speed of 641 km/h (345 kn, 400 mph) at 10,000 m (32,810 ft). However, the turbochargers proved unreliable and without them the aircraft was inferior to the Yakovlev Yak-1. The second Su-1 prototype, built as the Su-3, differed in having a revised wing section with wing area reduced to 17 m� (183 ft�). Completed in 1941, the Su-3 demonstrated good performance but suffered from continuing problems with the TK-2 turbochargers. Further development was cancelled when production of reliable TK-2 turbo-chargers was delayed. Green, W; Swanborough, G (2001). The Great Book of Fighters. MBI Publishing. ISBN 0760311943. "Sukhoi Su-1, 3". Sukhoi Company Museum. http://www.sukhoi.org/eng/planes/museum/su1_3/. Retrieved 2007-01-14.